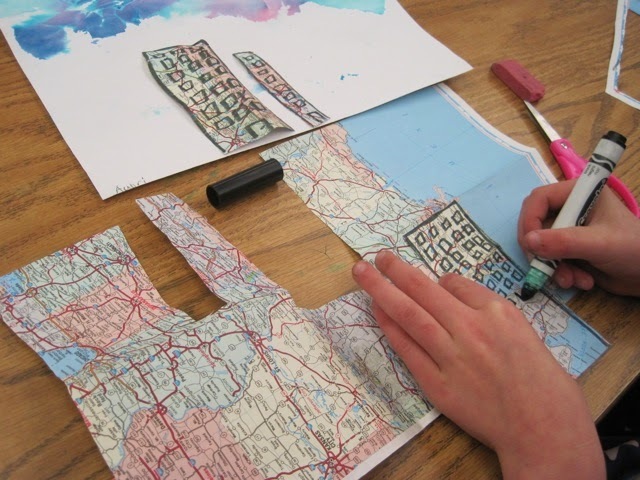 Creating Art With Kids: what can you do with an old map? what can you do with an old map? Like a lot of people, I scout around on Pinterest for ideas. When I find an art activity that looks interesting, I post it to my own "Art Things To Try" Pinterest board. So the other day when I was getting ready to substitute in a friend's second grade classroom, I went looking on that board for something new to do. I landed on two different ideas that intrigued me. 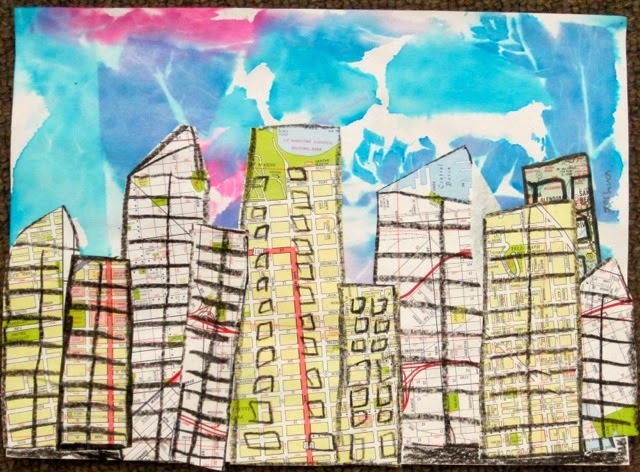 One was using bleeding tissue paper with just water to create colored paper; the other was creating a cityscape collage using the classified pages from a newspaper. Jumping off those two ideas, I came up with this cityscape idea. 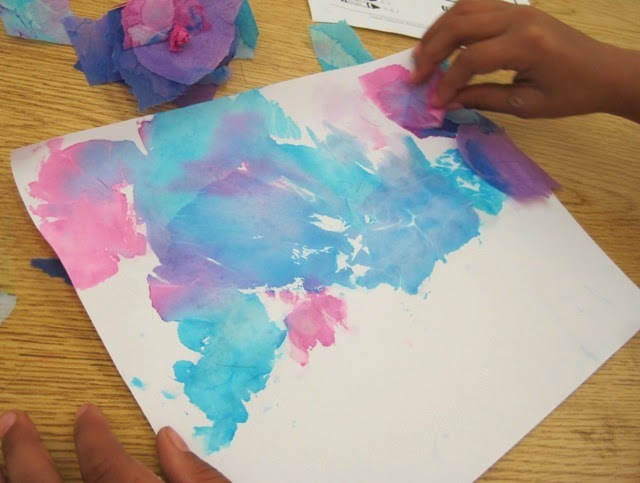 To create the colorful background, the students used bleeding tissue paper, applied to wet paper. I happened to have an overabundance of blue and pink tissue paper, so I encouraged them to mix the blues and add a little pink to suggest a morning or evening sky. They just needed to brush on a little water, apply a torn piece of tissue paper, and continue applying sections of tissue until about half the paper was covered. We let it sit for about a half hour, then peeled off the tissue paper. Since I had recently discovered about thirty old maps in my filing cabinet, we used those for the buildings. I cut up several, handed them out, and showed the students how to draw rectangles in between the folds with black marker or crayon, draw windows, and then cut them out. I suggested that they make eight or nine buildings of different sizes, and encouraged them to draw some interesting rooflines. I demonstrated putting the taller ones in the back with a little space between them, and then the shorter ones in front, to create a feeling of depth. 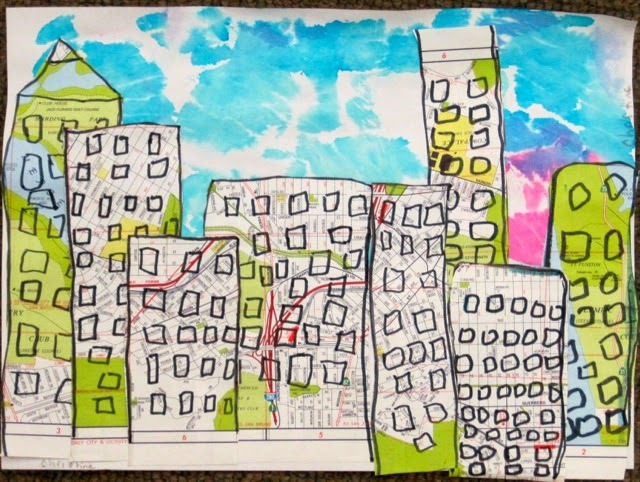 I love the colors of the buildings drawn on maps, and it was interesting to watch kids actually choose sections of maps to use. One student even flipped her map over and drew a building on the list of cities. The skies are particularly beautiful. We had talked about leaving white space to represent clouds, and many did, but the best part of this was that no glue was involved at all... just water! The colors are brilliant and the blending is actually more interesting than with a tissue paper (with glue) collage because the water helped bleed the tissue color more fluidly than glue. This lesson will definitely go into my file for future use... and I still have a ton of maps! 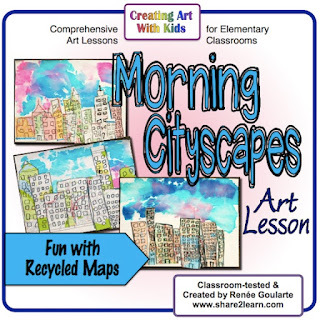 The full lesson, available in my Teachers Pay Teachers store, has easy, step-by-step directions and includes an art reflection worksheet for students, designed to help them think about their own art work and their creating process. Enjoy!